There's something about tostadas that just equals fun. I mean, balancing a pile of tasty toppings that are battling you with every bite. The food tastes so darn good that you can't wait to close your lips around it, yet certain toppings seem to yearn to jump kamikaze to the floor...the table...your plate...your shirt...before they make it to your mouth. Well, I for one am willing to coax tangy, juicy chicken, spiced black beans, and a warm, crispy shell in the right direction. I'm even ready to use my already messy fingers to pick up stragglers. Believe me, it's all worth it. Dry-roast the unpeeled garlic cloves on a skillet over medium heat until soft and blotchy-black in places, ~15 minutes. Peel and add to blender jar along with oil, vinegar, broth, cloves, sugar, spices, oregano and ½ tsp. salt. Puree until smooth. Pour mixture into a large skillet (~10") and bring to a simmer. Nestle the chicken inside the simmering broth and cook gently until chicken is cooked, ~18 minutes. 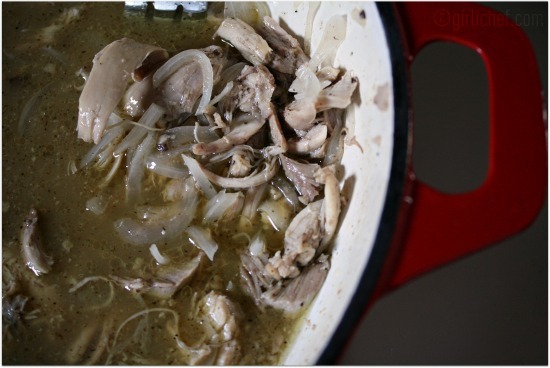 Scoop the sliced onion into a bowl, then pour the hot cooked chicken mixture over it. Cool, remove chicken and coarsely shred. Stir back into mixture, then taste and adjust seasonings if necessary. To serve, heat the beans and spread a layer on top of the tostada shells. Lay a few slices of hard-boiled egg over the beans, then spoon some of the chicken (hot or at room temp.) on top and sprinkle with cilantro. I love the sound of the chicken but I cannot deal with tostadas! I am far too messy an eater. Can I have mine in a nice soft tortilla with a little bit of crema please? After a description like this, how can I refuse? That last photo is irresistible. Tostadas is my big time comfort food. They must taste great with that Yucatecan Escabeche. I was looking through that cookbook this past weekend ... how the heck did I miss this delicious looking meal??? Will be giving this a try soon. Your posts always make me hungry, Heather! This recipe sounds so good. I love the flavours and spices you have used, and the hard boiled egg is such a great addition! Thank you for sharing this recipe with the Hearth and Soul hop. This looks good, Heather! And tostadas are fun! When you dribble down your shirt at least you know you're in good company. Oh my, they look so good! Definitely worth messing up my shirt for. Que delicia, que ricas esas tostadas. I don't have to have a tostada to get food on my shirt - I can do it just fine with a fork or spoon :) These look great! This is something that hsa always intrigued me; love the way you explained it; sure looks good. Me gustan mucho tus recetas, quisiera hacerlas todas !! Tostadas always feel like party food to me...partly because you get to eat them with your hands and partly because they taste like a party in your mouth! these look awesome. This looks delicious!!!!! Awesome pictures. Mmmm, yum! I'm on a high protein diet and I think chicken, beans, and egg would certainly help me meet my protein goals! Might have to give this recipe a try. Food that requires finger lickin' is finger-lickin' good! i love it! I love pickled jalepenos & carrots on my mexican food and last night I pickled some onions in red wine vinegar for our fish tacos. We eat Mexican food weekly and this reicpe is the very next one I try. The eggs must be fabulous on chicken tostados, never wouldof thought! THX! Me encanto esta receta! Que idea tan genial! O sera que me encantan las tostadas?!! ja ja ja! Anyway, congratulations. Love all kinds of toast recipes! How do you keep the tortilla from being soggy? This looks like it will be great with various meats. oh wow - this dish sounds so unusual to me but also delicious. I love the unique combination of ingredients! Thanks so much for linking up. 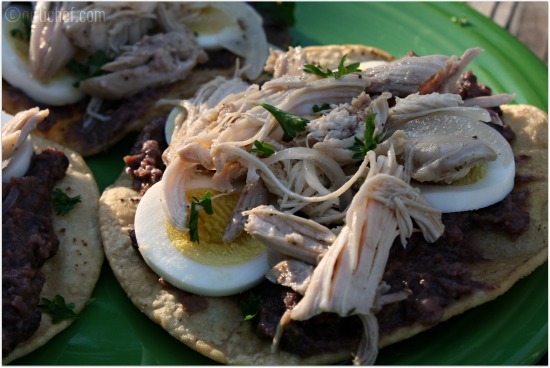 I love tostadas, and that chicken looks amazing! I can't wait to try this out at my next dinner party. 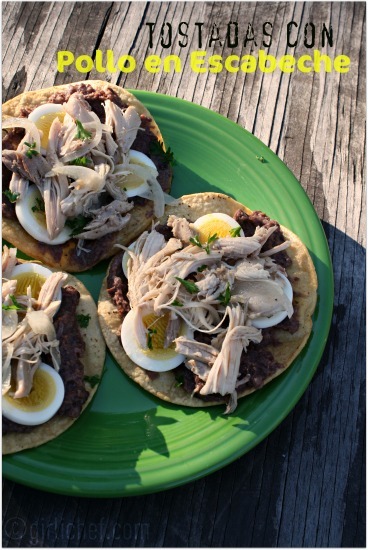 Heather, I've never had Pollo En Escabeche, but you have me longing to wrangle some on to a tostada to try it! Dang girl, you have an amazing way with words. Thank you so much for bringing your wit and excellence to my linky party! Man these little beauties are making my stomach do flips. Tostadas are tasty and fun but these look even better than the ordinary ones. Tried this recipe some time ago and love it! Never heard of pickled chicken.